Audi has a lot of accolades to its name  from pioneering the quattro all wheel drive technology to dominating endurance races around the globe. But the first thing that comes to mind today when you hear the word 'Audi' is a set of flashy light emitting diodes. Audi's romance with these tiny illuminating pinheads is well known and has now given birth to a new variation called the Matrix LED. Given the wide pattern in which the luminance of an LED can be altered, the Matrix lamp is claimed to be the first electronically controlled glare-free high-beam system. The Matrix headlamp unit consists of 25 segments per side and each one of them can be controlled individually, allowing for 966,105,422 variations in lighting. The headlamps make use of a camera to scan the surroundings and accordingly choose an optimum light distribution pattern. It can therefore adjust the beam constantly to reduce glare. It can scan up to eight cars and mask the throw of the light around them to ensure maximum visibility for both you and the oncoming car. If the car's infrared night-vision camera detects a pedestrian or animal that is dangerously close to your driving line, the Matrix lamps automatically flash beams in their direction. This not only warns them about the oncoming car, it also alerts the driver about their presence. The Matrix system can also work with the GPS to understand the road directions and can pre-plan the lighting patterns to sufficiently illuminate bends and turns. Even the cornering-lamp function is achieved by selectively illuminating the required LEDs. The lamps do not make use of any mechanical motors unlike the new S-Class, employing software instead for faster switching of the light distribution patterns. It is an innovative piece of gadgetry that is expected to become mainstream for the carmaker in a few years. Audi has brought the Matrix LED headlamps to India now and are available with the 2015 A8L that was shown to select clientele at the 2014 Auto Expo. The car is already on sale in India and has the Matrix LED tech as a standard fitment across the range. The Matrix lamps look like a flat array of reflective panels spread out like a pack of playing cards, but look closely and you'll notice that it's a combination of a metal brackets and multiple LEDs. The resultant new headlight assembly now has a flatter lower edge and sits atop a new front bumper. Also new is the bonnet with revised sculpting and the redesigned single-frame walrus grille. 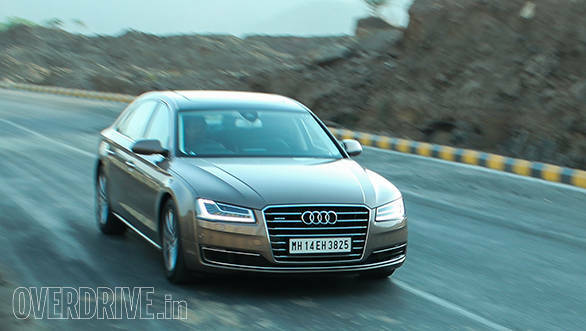 The new face of the A8L looks simpler yet futuristic. The back end now has new LED taillights and these too have a flatter design. The redesigned bumper incorporates rectangular exhaust pipes. There is a fair bit of chrome lining on the tail and essentially highlights the width of this limo. Interestingly, our test car still bore the conventional engine badging viz. '3.0 TDI' instead of '30 TDI' that is expected to be the new norm for Audi cars. On the inside, the only noticeable difference is the new 'Unicum' leather that has a more natural, skin-like texture unlike the grainy leather used in conventional upholstery. The new leather wraps the seats, parts of the dash and door panels and the seamless centre console that flows from the dashboard to the rear seat-back. 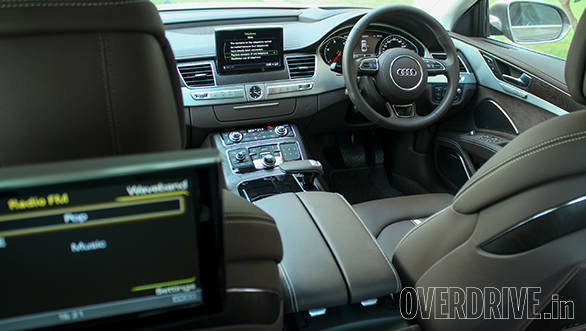 The rear seats offered on the India-spec A8L come with the 'Executive Package', which provides airline grade seats that are plush and have a reclining backrest. The rear left seat also gets a footrest and a massaging function with various patterns and intensities. This A8 being the long wheelbase version, you have ample legroom in the rear seats. Out of the long list of options available on the A8L, out test car came with built-in cooler, a 230V two-pin power socket, ambient LED cabin-lighting, folding tables, a panoramic glass roof and an ionizer for the four-zone climate control system. Most of these features are more useful than gimmicky. Other options include over 100 exterior and 23 interior colour options, 12 wooden inlay varieties, an intelligent central locking system, an automated parking assistance system and in-car WiFi hotspot capability. While most of the features and creature comforts are at par with the rest of the competition, it is the plethora of customisation options that give the A8L some distinction. Our test car ran the 3.0-litre turbo-diesel engine that is good for 258PS between 4000-4250rpm and 580Nm from 1750 to 2500rpm. Audi claims that this variant manages to sprint from 0-100kmph in 5.9s. The best figure we managed was 6.9s. The torque figure has gone up by 30Nm over the previous model and it has a direct impact on the driveability and fuel economy. 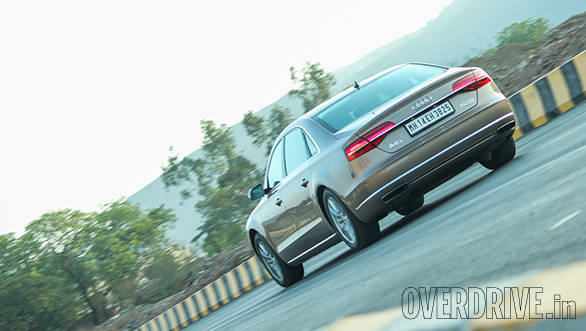 The A8L 3.0 TDI manages to cruise at 120kmph in top gear at a mere 1500rpm. Driving through urban conditions is pretty effortless too and the eight-speed dual-clutch transmission makes for quick, unnoticeable shifts. Our tests returned a fuel economy of 10.4kmpl and 6.7kmpl on the highway and city runs respectively. The A8L comes with the adaptive air-suspension, which can be altered for stiffness levels. The driver can choose between comfort and dynamic modes or let the computers adjust the ride height and damping as per the speed and road conditions. The suspension setup works amazingly well on our roads and ride quality is comfortable throughout. The tyres aren't too low in profile either. The deeper potholes and tall speed humps need to be dealt with care though as scraping the corners of the car or its underbody is quite easy  thanks to the long overhangs and relatively low ground clearance. The mechanicals are mated to the quattro all-wheel-drive system, which not only aids in high speed stability, it also makes sure that this 5.1-metre long limo can tackle and shoot out of a corner with complete composure and a wide grin on its face. While doing so though, the cabin remains as silent as you would expect from luxury car in this segment. This segment has suddenly seen a lot of action recently. Close on the heels of the updated Audi A8L came the locally produced Jaguar XJ 3.0, followed by the soon-to-be launched Mercedes-BenzS350 CDI. While the latter is the most expensive of the lot and the Jaguar being the cheapest, the Audi A8L finds itself right in between with a good balance of features, price and technology. What will help it attract customers though is not those tech-laden Matrix LEDs, but the wide of range of customisation and engine options that the A8L offers. With cheaper alternatives like the XJ-L and the 7 Series on one end and an all-new benchmark from the S-Class at the other, A8L finds itself in a tight spot. 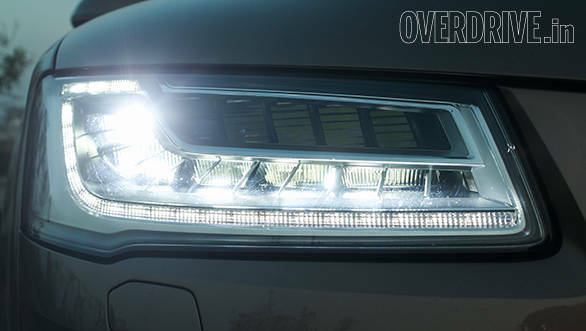 Can the groundbreaking new lights be enough to fend off the formidable competition?Customisation options and aggressive marketing seem more likely to help Audi achieve that.